Here at Belly Button we love nothing more than a fabulous party, and what could be more fabulous than having one to celebrate our Henries Platinum win! 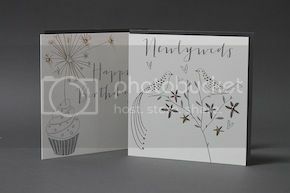 This year our best-selling metallic foil embossed Platinum range received a prestigious Henries award for ‘Best Relations and Occasions’ and we couldn't have been happier! We had a lovely party this morning to celebrate, and of course a party isn't a party without tea and cake (which we had plenty of).